Dickens began his writing career during a period in which social observers of the city began to fear that a separate and sinister underworld had developed in the heart of London, the world’s largest city. And, as we will see below, Portsmouth was viewed in the same way. 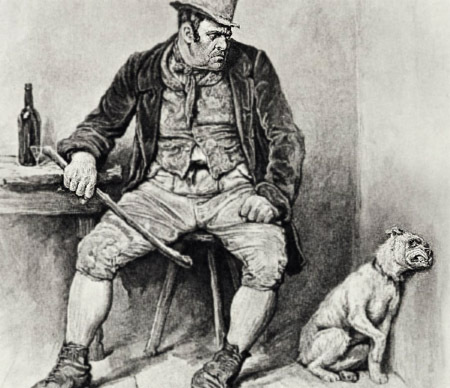 Bill Sykes and his dog, Bull’s Eye, by Frederick Barnard. Victorians began to write of a ‘criminal class’ who lived entirely on the proceeds of crime and preyed upon the respectable people of the West End of London. To make matters worse, this ‘criminal class’ lived undetected in the dark backstreets, ‘rookeries’ and courts of the East End, a place where ‘civilised’ people feared to tread. However, the Victorian idea that an organised underworld separate from the rest of society was systematically preying on the wealthy was largely a myth and perpetuated by social researchers such as Charles Dickens and Henry Mayhew. Alley with an open sewer. A dirtier or more wretched place he had never seen. 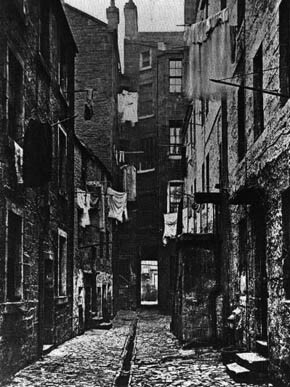 The street was very narrow and muddy, and the air was impregnated with filthy odours. There were a good many small shops; but the only stock in trade appeared to be heaps of children, who, even at night time, were crawling in and out at the doors or screaming from the inside. The sole places that seemed to prosper, amid the general blight of the place, were the public houses; and in them the lowest orders of the Irish were wrangling with might and main. Covered ways and yards, which here and there diverged from the main street, disclosed little knots of houses, where drunken men and women were positively wallowing in the filth. Dickens witnessed for himself the ‘dangerous’ underworld of London and recounted his tour of the ‘plauge pots’ of the capital in his journal Household Words. On one expedition, he visited the underbelly of Westminster which he described as the ‘Devil’s Acre’. He informed his readers that it was an error to think of Westminster as simply a district of splendour and grandeur since in the back streets flowed ‘the blackest tide of moral turpitude’ as it was ‘the most notorious haunt of law-breakers in the empire’. In both Oliver Twist and his reports in Household Words, Dickens explicitly linked filth and squalor with crime, immorality such as prostitution and the ‘criminal class’. Dickens’s portrayal of a morally depraved underworld that lived in filth and squalor became an accepted view of the poor in the East End by the 1850s and led other social explorers to investigate similarly densely populated towns in Britain. The linkage between urban squalor and the formation of a ‘criminal class’ proved a compelling explanation for crime for those Victorians who turned their attention to Portsmouth. In a report to the General Board of Health in 1850, Rawlinson, the superintending Inspector, wrote, ‘filth fosters disease, and engenders crime; and heavy rates are required to maintain paupers and criminals’. The Hard (top) and Blossom Alley (bottom), one of the many back streets in the ‘Devils Acre’ Portsea area behind the Hard. They [crimes] are generally executed by persons having no ostensible means of support – persons who get their living by roaming about the country … who are the very pests of society … there is in the metropolis a large body of persons who have devoted their lives to thieving … who have taken advantage of the facilities offered by the railway. Also famous for dwellings of those kind-hearted children of Israel who supplied the wants of seamen at the moderate interest of about 500%. Talk of the London Jews – keen as they are – a Point Jew would have cheated a dozen of them in an hour. Bloated, draggled women in dirty print frocks, who lounge along in twos or threes without bonnet or shawl, and who in broad daylight make your flesh creep with their loathsome words and gestures. These are some of the companions of our soldiers and sailors, in whose society they spend their hours of leisure. They are just now sunning themselves on the Hard or Queen Streets, and are waiting to pick up the latest gossip about the Channel Fleet, or drink a dram with a friend. Their name is legion, and, as you look into their faces, each one seems fouler than the last. 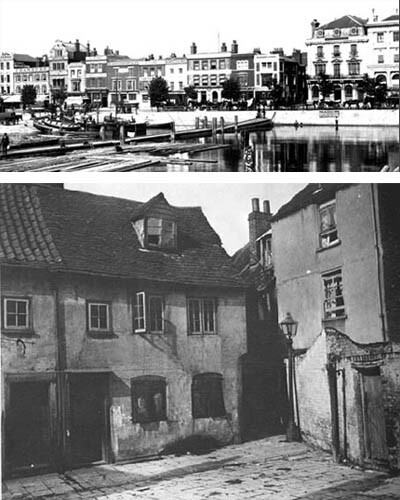 While these sensational accounts of Portsea were undoubtedly influenced by social explorers such as Dickens and Mayhew, it is questionable whether these accounts truly reflected the levels of crime in nineteenth-century Portsmouth. Transportation, mainly to Australia, or hard prison labour were the usual punishments for ‘serious’ crimes in this period. In England, these convicts were sent to national prisons such as that in Portsmouth. 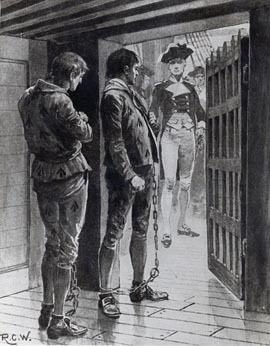 Those sentenced locally at the Portsmouth Quarter sessions for less serious crimes, or those awaiting trial, were kept in the Borough prison which was under local control until the 1870s. 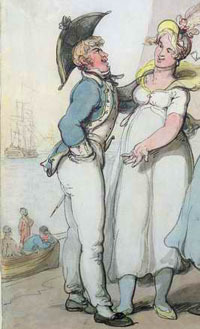 Convicts leaving Portsmouth to be transported to Australia. The Borough gaol in Penny Street, Old Portsmouth, opened in 1808 and was extended in 1832. Throughout, it was overcrowded, lacked separation between different prisoners such as juveniles and older offenders, was lax in discipline and was not a great deterrent. It contained different wards for debtors, those not sentenced to hard labour and those awaiting trial. They had nothing to do with their time and were allowed to associate freely. In the dockyard … heavy manual work, mostly involved in moving, stacking timber, landing and stowing coal, general repairs etc. In Clarence Yard, cleaning, painting, white washing. For the Royal Engineers in Portsmouth, cleaning mud from the moats, levelling Southsea Common, making roads, carting shingle, dragging moats, mowing grass on ramparts, breaking stones, cleaning bricks etc.